Combine the best of pay TV, movies or sports and Freeview. Flexible contract lengths from one month to one year. Stream direct to your TV or watch on your mobile or other device. Although most of our best TV packages are bundled together with broadband, there are lots of good TV-only packages if you're happy with your broadband or still under contract. Most TV-only deals are streaming services, but a few of the big name broadband providers offer TV without broadband. Some of Virgin's TV packages are available without broadband. Virgin offers a wide variety of channels — including FOX, Cartoon Network, Eurosport, a few Sky channels and, depending on your package, BT Sport and Disney Channel — on top of Freeview. You'll get a 500GB TiVo so you can watch, pause, rewind and record live TV. You can get Sky TV without broadband very easily. 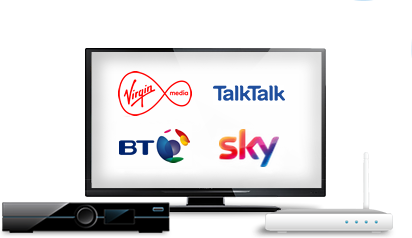 Sky Entertainment is available with or without broadband so you can mix and match with different providers. NOW TV is a streaming service that lets you access different live channels depending upon which TV Pass you buy. Sign up for the Entertainment Pass and you can watch Sky Atlantic without a Sky subscription. Casual sports fan who only cares about a few teams? Get Sky Sports on a daily, weekly or monthly basis. The Sky Cinema pass gives you access to Sky's 11 dedicated movie channels plus over 1,000 films on demand. Kids pass offers dedicated children's programming, including thousands of hours of on-demand episodes. If you use the NOW TV Smart Box, you can watch Freeview, too. TVPlayer is a streaming service for live TV. Freeview channels are available for free, but you can upgrade to a monthly paid subscription to remove ads and get access to 29 additional pay TV channels — including Eurosport, Discovery Channel, MTV and Cartoon Network — so you can access premium kids series, entertainment shows and sports channels.